In the largest city of the East Ghouta district, Douma, civilians and military personnel have been liberated from the “jail of repentance,” where they were kept prisoners for years by Jaish al-Islam terrorists. There were hundreds of women and children from the city of Adra, which was captured by terrorists in December 2013. Adra is one of the largest industrial cities in the suburbs of Damascus. In December 2013, militants seized the city and massacred civilians while many were taken prisoners. A source in the Syrian security forces told Sputnik that "information about the repentance jail” is partially confidential, but it can be confirmed that this prison was not the only one in Douma. “In such places, extremists tortured the abducted people, forcing them to repent of their sins. Thus, they wanted to realize the doctrine of a peaceful revolution. But what sins do children, who were the greatest number in the prison, have to repent?” the source asked. According to the source, there were 3,500 inmates in the prison. The terrorists used them as a human shield to put pressure on the Syrian army, which did everything possible to save the lives of the people of the city. The source went on to say that currently, terrorists from Jaish al-Islam are negotiating with the Russian side, which is providing humanitarian corridors from Ghouta. According to the source, these terrorists wanted to leave, as did Ahrar ash-Sham and al-Nusra Front, after the hostages were released, but in this case, the negotiations have been delayed, due to the situation’s many complex aspects. The Russian Defense Ministry said Monday that nearly 6,500 militants have left the Syrian town of Irbin over the past two days. 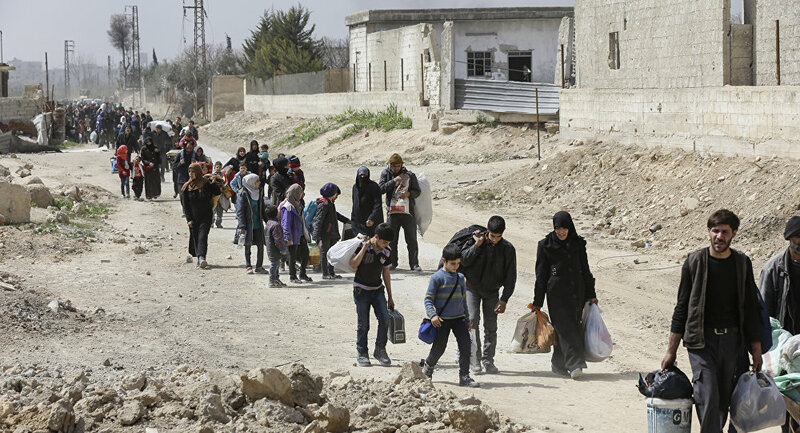 According to the ministry, 4,979 militants and members of their families were relocated from Harasta in Eastern Ghouta to Idlib province on Sunday after agreements were reached by the Russian center for Syrian reconciliation with the leaders of the Ahrar al-Sham group. The ministry also added that almost 114,000 people have left the Damascus suburb of Eastern Ghouta since the beginning of the humanitarian pauses.